Nice. The reaction from the announcers is classic. They may not win a lot at PSU, but they have a good time! Speaking of PSU, yes, that’s one of our non-league games this season. But they might not be the layup you might think in just glancing at the schedule. Here’s some spring things to know about the Vikings. 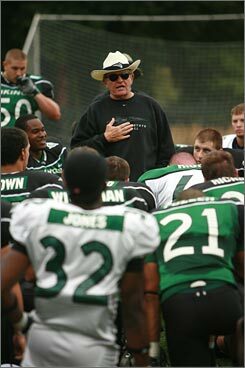 Last Year: Struggled to a 3-8 season, 3-5 in the Big Sky, in Jerry Glanville’s first-ever NCAA head coaching job (Glanville had a long NFL career, but never was an NCAA head coach). HOWEVER, one of their conference wins? They went to Cheney and beat Paul Wulff’s EWU Eagles, 28-21. PSU was down 14-7 at half, but then scored three straight TD’s in the 2nd half to put it away with 3+ minutes to go. Portland State won the last two games against Wulff and EWU in ’06 and ’07. Offensive Scheme: Run-n-Shoot, all the way. The same offense that made Warren Moon a Hall-of-Famer as a Houston Oiler is now at Portland State. Mouse Davis, the OC under Glanville, is regarded as the “father” of the Run-n-Shoot, something he mastered in the late-70’s. Interestingly enough, Davis led Portland State to 20 NCAA D-II passing records. His most recent success was at Hawaii, under June Jones no less. Under Davis, the Warriors led the nation in passing offense, total offense, scoring offense and pass efficiency rating. In ’07 PSU led the nation in passing offense, throwing for 360 yards per game. These guys know how to move the ball, period, and have done it for decades. The really bad news for PSU is how much they’ve lost in the skill positions. All those TD passes have to be caught by someone, right? Not only will they still be young at QB, but the top three WR’s are all gone from last year. But it’s not like it’s a true system that relies on superstar talent. Just look at the success Hawaii has had recently, and you realize that very few of those players from 10-win seasons are going to the NFL. So it’s definitely more about plugging in the pieces into the scheme and watching it go. Top Defensive Player(s): While PSU lost their top tackler from last year, they do return #’s 2 and 3 from last year in OLB KJ McRae and ILB Andy Schantz. McRae had a big season last year, racking up 70 tackles, including 12.5 for loss, 5 sacks, 2 forced fumbles and an INT. McRae has excellent size at 6-1, 240, and is an all-conference candidate on the outside after honorable mention last year. Schantz is an outstanding inside linebacker, totaling 85 tackles, 9 for loss, 3 sacks, a team-high 3 forced fumbles and was basically all over the field. Like McRae, Schantz is a decent-sized linebacker at 6-1, 235. He is regarded as a team leader in the heart of the defense, and was also honorable mention in ’07. The linebackers will be their best position on defense. Bottom Line: This is a dangerous opponent. After coming off the road game at Baylor, we’ll still only be on our fourth game of the year. Wulff will have to get the emotions charged up for this one, not only coming off the Baylor game, but to avoid peeking ahead to the next week. For the hated Yucks of Oregon will be looming on 9/27! The scary part is that unlike our early-season opponents, Portland State won’t be too surprised by what they see out of WSU. If there is a “trap” game of 2008, this is it. PSU opens with Western Oregon and UC Davis before coming to Pullman, and we are their first – and only – BCS school on the schedule in 2008. You know they’ll be sky-high for this one. But even with the return of McRae and Schantz at linebacker, they were pretty bad defensively last year. San Diego State drilled them 52-17 in 2007. That’s the same SD State team that Brink absolutely devoured last year. So what can you expect? Yards and points by the bushel. We’re a long way from the season, but you can see this one coming nearly 4 months away. Nice late-September weather in the Palouse, and our no-huddle vs. the Run-n-Shoot? It should (hopefully) be a fun one to watch. You are currently browsing the archives for the KJ McRae category.